When a gunman walks into a diner where she’s grabbing a bite, black belt Imogen knows exactly what to do… except she doesn’t do it. Cramming herself under a table and locking eyes with the only other customer is the last thing she remembers, but it wasn’t the last thing that happened. It couldn’t be, because when the police killed the gunman she ended up covered in his blood. Being a black belt has shaped her whole life. Imogen has always prided herself on her strength, her integrity, and how she exemplifies the Tae Kwon Do way of life in her everyday behavior. Except now she hasn’t, and everyone at school is questioning the point of having a black belt if she hides under a table in a holdup. Worse, Imogen is questioning it too. Through sessions at school meant to help herself and Ricky, the other survivor, cope with the shooting, Imogen realizes she needs to prove herself. And the only way to do that is to get in another fight. Walking alone late at night and wandering through town never delivers what she wants… but she’s hoping Ricky will. She offers to teach him how to fight, and her garage becomes their training room. But even as their relationship deepens, she knows he’s always holding back. He won’t really fight her because she’s a girl, which only infuriates her more. Imogen’s self-control spirals away from her as the trauma of the killing in the diner burrows deeper. Her family and friends – together with Ricky – try to make Imogen understand what happened in the diner that night, before she loses sight of who she really is. Next ›Are Contests Worth It? I'm not very much into contemporaries, but this does sound intriguing and different enough to give it a go! Pili – I'm not a contemp fan either, but this one has an edge, and a voice. As a female athlete it was cool to see someone nail that feeling. This sounds amazing. As a blackbelt in karate (although not currently training), I've always wondered how I'd react in a really scary situation. 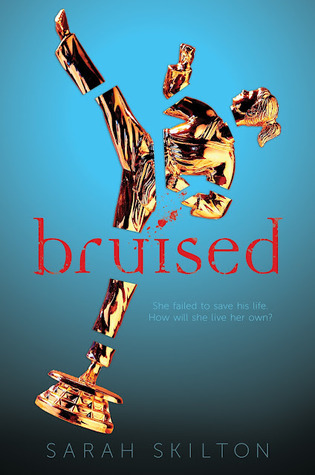 Ashley – definitely pick up BRUISED. It's a fantastic read, especially if you already speak the language of the sport.